The M141 Bunker Defeat Munition (BDM) SMAW-D is the single shot, disposable version of the combat proven US Marine Corps' Shoulder-launched Multipurpose Assault Weapon (SMAW). Half the carry weight of SMAW, SMAW-D provides the same massive target over-match effects against field fortifications, urban structures, and lightly armored vehicles. 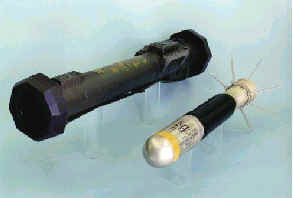 Type Classified and in production, the U. S. Army's Bunker Defeat Munition, is a Modified NDI weapon system capable of defeating fortified positions (bunkers) constructed of earth and timber. TACOM-ARDEC teamed with Talley Defense Systems (TDS), Mesa, Arizona to field a disposable version of the USMC's Shoulder-launched Multipurpose Assault Weapon (SMAW), called the SMAW-D. The BDM SMAW-D includes a night sight mounting fixture, weighs 15.7 pounds and is 32 inches in length. The BDM system can also breach masonry walls and defeat lightly skinned armored vehicles at effective ranges of 15-500 meters. The Bunker Defeat Munition (BDM) is a modified Non-Developmental Item (NDI) that will meet an urgent FORSCOM requirement to fill the "Bunker Buster" void in the Army inventory. The shoulder- fired system is effective against targets including fortified positions (earth and timber bunkers), breaching masonry walls and neutralizing light armored vehicles at ranges of 15- 500 meters. The system is fully operational at 11 meters making it an optimum weapon for Military Operations in Urban Terrain. SMAW-D uses the same High Explosive Dual Purpose (HEDP) rocket that was successfully employed by the USMC during Operation JUST CAUSE, and by both Army and Marine units in Operation DESERT STORM. The HEDP rocket is packaged in a light weight, rugged, disposable launcher that is simple to place into operation under any battlefield conditions. The SMAW-D Bunker Defeat Munition is easily transported by one soldier, and is airdrop certified. Each round has a unique fuze that automatically selects the proper detonation mode to maximize warhead destructive effects on each target. If the rocket hits a soft target, such as a sand-bagged bunker, the fuze delays warhead detonation until the rocket has buried deep into the target. Warhead burial produces the signature HEDP heaving effect, which devastates these soft targets. Rocket impact on a building wall, lightly armored vehicle, or other hard target causes the fuze to detonate immediately. The warhead's high explosive charge is therefore squashed against the target, which results in enormous target holes and propels large fragments inside the vehicle or behind the wall. SMAW-D offers unrivaled destruction against earth and timber bunkers. It also provides devastating effects against light armor, and breaches 8-inch reinforced concrete and 12-inch triple brick walls. Every launcher has a permanent night vision device mounting bracket that permits quick attachment of the AN/PVS-4 night sight, AN/PAQ-4 or AN/PEQ-2 laser aiming lights, or any similar device with rail grabber attachments. In the statement of managers accompanying the conference report on the National Defense Authorization Act for Fiscal Year 1994 (Public Law 103-160) (H. Rept. 103-357), the conferees agreed that the Army should pursue a limited, interim program for procurement of a bunker-defeat munition (BDM). The conferees also agreed that the Marine Corps' short-range anti-armor weapon (SRAW) and the Army's BDM were too similar to justify maintaining separate programs for the long-term. The conferees believed that a long-term solution to the problem should be sought which drew from the SRAW missile and from warhead technology developed in the Army's multi-purpose individual munition (MPIM) program. Congress capped procurement at 6,000 rounds. Given the restricted procurement, BDM is only stocked for contingency use. BDM entered war stock during FY99. The SMAW-D achieved full Materiel Release in 1999, and production rounds are currently being delivered to U. S. Army depots. Rounds are now being shipped to selected sites for gunner training and prepositioned combat readiness stock.